Religious Studies Review (2011): Geoffrey W. Sutton writes 'The lessons learned by those who forged opinions in the fires of hate and turned their stories into bridges to freedom are powerful narratives, which may serve as catalysts for forgiveness and reconciliation ..they offer qualitative evidence that a mixture of courage and humility can infuse dialogic encounters with hope that persons of diverse ethnic and cultural backgrounds can forgive and reconcile rather than perpetuate violence.' To read the full text of review click here. Publishers Weekly: "...a blissful read and a persuasive argument for forgiveness as a practical tool for global survival....Henderson shows the real muscle behind forgiveness, avoiding preciousness and sentimentality. He writes, ‘Forgiveness has an image problem’—with this latest effort, perhaps no more.” To read full text of review click here. The Irish News: Under the headline 'Letting go of resentment can free us from past pain', Anne Hailes writes "Michael's book is compelling. Every page is worth reading and the beauty about it is this author doesn't preach, he puts forward modern experiences of people in Nigeria, Israela and Palestine, Germany, Rwanda, the United States, Northern Ireland and many more.... Certainly this book will make you stop to consider your approach to life and living and offer some guidance." To read the full text of review click here. The Washington Times: Julia Duin writes "These are gut-wrenching things I cannot imagine forgiving... So, should I delete the message in my outbox? I'm not able to. Not yet." To read the article click here. New City, the magazine of the Focolare Movement: Frank Johnson writes "No Enemy to Conquer is a remarkable book because it doesn’t moralise but simply lets the power of personal and group experiences of real situations go to work on the reader. It should be on the shelf of every politician and every individual who consider themselves committed to the cause of peace and harmony. It deserves as wide a readership as possible." To read the article click here. TIKKUN, one of the leading Jewish magazines in the United States has a review by Roger S. Gottlieb (writing about No Enemy to Conquer and another book, Beyond Revenge: the evolution of the forgiveness instinct by Michael McCullough): "And in fact many of the narratives in Henderson’s serious, thoughtful, and at times compelling book confirm McCullough’s positions, but they also include some important elements that McCullough ignores...Despite these authors’ serious attempts to make forgiveness comprehensible, the human heart remains a mystery to us all. Yet at least these books tell us that the changes are possible for us as human beings and have many times, against all expectation, actually occurred. That alone makes both of them very much worth reading." To read the article click here. Andrew Rigby reviews No Enemy to Conquer in Peace Review: A Journal of Social Justice, an influential quarterly publication in the field of peace and conflict studies, edited by Dr Robert Elias of the University of San Francisco: "The examples are empowering, particularly for those of us who have direct experience of the power of forgiveness as a process in transforming relationships. Such processes constitute one of the key means of nonviolent conflict transformation at the interpersonal level ... I know from my own experience and from the responses of my students when Michael Henderson came to present a seminar to the class: people are moved and inspired by stories. And Michael Henderson is a wonderful storyteller." Read PDF of review here. The Huffington Post: Marina Cantacuzino, the founder of The Forgiveness Project, reviews Michael Henderson's book on this authoritative liberal website. Under the headline 'The easy path to Islamic extremism', she writes, "One of Henderson's aims in writing No Enemy to Conquer is to bridge this dangeous gulf and find an 'appreciation of our brothers and sisters of the Muslim faith.' One way he does this is to recount stories where fear of former, or perceived, extremists has blended into understanding through simply listening to the other's story - a process which re-humanizes the enemy." To read the article click here. The Invitation: In the UK Islamic Community Magazine, Imam Dr Musharraf Hussain, a joint Chairman of the Christian-Muslim Forum of Britain writes "'This book represents a tour de force between victims and offenders and soul-stirring tales of human goodness. One of the greatest insights that emerges from 'No Enemy to Conquer' then is that forgiveness means that we become capable of living with the past without being held its captive." Read more here. EMEL, ‘the Muslim Lifestyle Magazine’: Forgiveness often seems impossible in today’s contentious world. This book presents stories of real men and women of different faiths and cultures reaching out to reconcile with others, previously deemed their ‘enemies’. Moving on in life from the position of victim through the healing process of forgiveness is epitomised in the example of the IRA’s chief explosives officer, Patrick Magee who planned the attack at England’s Grand Hotel in Brighton, being reconciled with the daughter of Sir Anthony Berry who was murdered in the blast. Henderson makes a strong case for the moral and ethical aptitude of forgiveness in public life and answers the concerns of those who have a difficult time with this essentially spiritual practice, which is held in such high esteem by all the world’s religions. Henderson has divided the book into segments on: Clash or Alliance?, Reaching out to ‘The Other’, Moving Beyond Victimhood, Taking Responsibility, Creating Safe Space, and Acknowledging the Past. Each section contains commentaries by world leaders, activists and peacemakers such as Desmond Tutu, the late Benazir Bhutto, Betty Bigombe, Rajmohan Gandhi, Joseph Montville, David Smock, Margaret Smith, Donna Hicks and Mohammed Abu-Nimer. A major emphasis in the book is to chart the great strides forward in the strained relationships between Christians and Muslims. No Enemy To Conquer is ideal for those who wish to grasp how human nature can be so forgiving in an unforgiving world. It gives you a strong dose of hope that is much needed in an increasingly cynical world. Tikkun Daily, a leading Jewish magazine: David Belden writes ""I asked my old friend Michael Henderson to send me a true story from his latest book, No Enemy To Conquer: Forgiveness in an Unforgiving World. I had no idea he would have one so central to Tikkun’s mission." To read full text click here. Spirituality and Practice: "An impressive, inspiring and edifying book on the spiritual practice of forgiveness in the public arena... We highly recommend No Enemy To Conquer and hope that it is widely read, discussed, and its lessons applied in communities around the world." To read full text of review click here. Eastern Eye, a leading British Asian newspaper, carries an article on its editorial page by the author. It is headed "Peace among men" and introduced with the words "The difficult ability to forgive is being lost in a world where violence is predominant, but it is needed now more than ever before, argues the author of a new book, No Enemy to Conquer." To read the article click here. Christian Science Sentinel (March 30, 2009): “Once again Henderson takes readers across the globe to share remarkable accounts of forgiveness that has led individuals, families, and national leaders to places of hope and healing. Unambiguously and without sentimentality, he makes the point that where vengeance finds resistance, forgiveness blossoms.” To read full text of review click here. The Examiner in Independence, Missouri: with the heading "Concern for others is what matters" its opening paragraph says "It is true that the world is infested with several hot spots where anger, killings, violence and hatred are a part of daily life. It is equally true that many nations, including our own, have a tendency to solve violence with more violence, even though recent experience has shown us it is not very successful. Anger, violence and hatred seem to breed more violence and hatred; leading many to believe there is no way out of this vicious cycle. 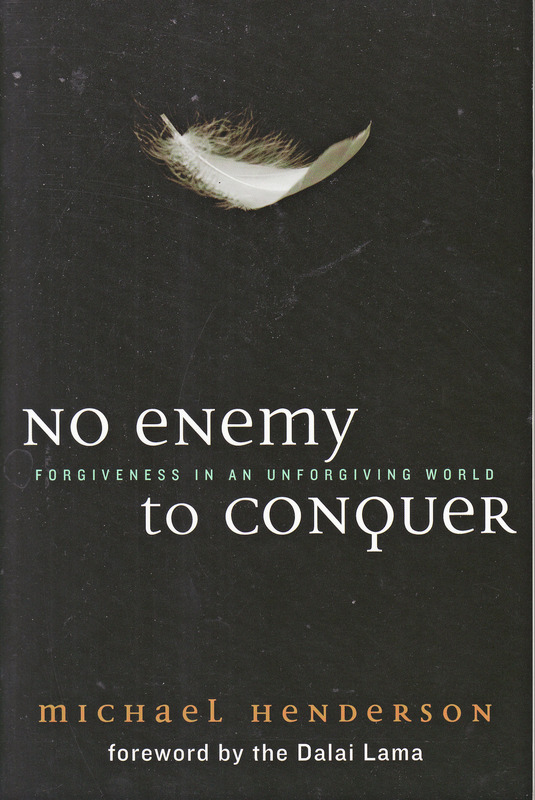 To those I would strongly recommend “No Enemy to Conquer; Forgiveness in an Unforgiving World,” by Michael Henderson." To read the article click here. The Council of Christians and Jews (CCJ) 'Chaplains' e-Zine': "However, for me, it was the degree of hope Michael gave to the reader that clinched this book as ’a must’. No Enemy to Conquer reveals that we have an inner enemy, prejudice, and opens up to for us the grace of forgiveness, which can lead us to a genuine inner and outer peace. Senator George Mitchell said: ‘For a durable peace and a genuine reconciliation there needs to be a decommissioning of mindsets’ this book achieves this. Many who read Michael’s book will find themselves on a life-changing journey, as he reveals his hope for mankind." To read the full text of review click here. The Tennessean: with the heading "Book shows that forgiveness can topple defeatism" the review says "What's hopeful about such stories is they bear witness to the unexpected. Forgiveness overthrows the day's defeatism." To read the full text of review click here. The Good Book Stall: "When the world seems no nearer to peace, a copy of this book should be given to all world leaders!" To read the full text of the review click here. Church of Ireland Gazette: Stephen R White writes on 22nd May "A well worthwhile reflection on a topic of universally vital importance." Download review (PDF page 12) here. Belfast Telegraph: In the religion column, published 5 September 2009: Another host of useful insights into forgiveness are contained in Michael Henderson’s timely book No Enemy To Conquer. This wide-ranging publication focuses on forgiveness in a global context, but there is refreshingly hard-headed assessment of Northern Ireland. Henderson points out that the ”profound changes “ here have not been achieved principally through forgiveness or repentance, but rather through a combination of some hard-liners softening their views, economic packages and development, and also persistence by the American, British and Irish Governments. He also warns that the political advances need to be underpinned by those who can build relationships and trust, in order to help heal the deep bitterness that remains. The Huntsville Times, Arkansas: "No Enemy To Conquer: Forgiveness in an Unforgiving World," by Michael Henderson, looks at examples around the world of how violence was ended by individual acts of forgiveness and reconciliation. Henderson counters forgiveness' "image problem" of being seen as something weak by offering story after story of people extending courageous and revolutionary forgiveness to an enemy. As he quotes Rajmohan Gandhi, "The stuff of forgiveness is sterner than suspected." To read online click here. In Print: "Their stories show the best that people are capable of under the worst circumstances: victims of extraordinary loss extend themselves to the perpetrators; courageous men and women reach out across religious, cultural and political boundaries to talk with the other; and people acknowledge responsibility for wrongs done by themselves or their communities, allowing victims to heal, move beyond the desire for revenge, and stop the cycle of violence." To read the full text of the review click here. Blog by Hilary Wilce, British journalist and writer, specialising in education and learning on 26 March: "Retribution is in the air. Everyone wants a go at Fred the Shred. But a new book asks us instead to consider the power of forgiveness. I can't decide if this makes it brilliantly timely, or badly out-of-step with the times, but whatever it is, it is important." Read full blog here. "This book should be required reading, not only for the general populace, but also for our so called 'leaders', both in government and in all faiths. Perhaps it would remind, especially church leaders, "to practice what they preach". I was afraid the book would be a heavy read, but on the contrary, it was easy and easily understood, - it is rare for me to find such a book 'unputdownable'. The message is simple yet contains a mountain of wisdom that we would all do well to absorb. If you have not read this book...read it. If you have already read the book...read it again. Thank you Michael for delivering this important message." Read full review here. Bill Tammeus, 'Kansas City 'Faith Matters' blogger, wrote on May 9: "To follow the previous two books, this one celebrates the power to forgive and to create new possibilities after terrible breaches. Drawing inspirational -- at times almost unbelievable -- stories from all over the world, the author describes what it took to offer forgiveness and what difference it made. In the end, this is a book of hope in a world in desperate need of exactly that." Read review here. Jesus Christ teaches us all about the power of forgiveness. Michael Henderson's book highlights that power in action. Forgiveness has for a long time been regarded as a purely religious construct but Michael Henderson puts this long-neglected subject into a more political context. He takes the concept from its personal and religious realms and shows its relevance to political life. This is an innovative and a pioneering book that invites us all personally and collectively to develop the most fundamental of moral virtues, forgiveness. This is a masterful work of a brilliant mind that deserves its place on any bookshelf. Its lucid, open-minded and poignant stories reveal how human beings on the one hand can be capable of the most unspeakable atrocities and the most devilish of acts against their fellow beings but yet also at the same time are able to demonstrate in abundance the divine characteristics of mercy, love, compassion and selfless sacrifice. These compelling true stories from some of the most courageous yet seemingly ordinary people illustrate the powerful nature of the virtue of forgiveness. This short book is a genuine masterpiece that weaves the diverse threads of theology, morality and politics in a seamless way. In short, No Enemy to Conquer offers constructive and positive rays of hope to a world that lives under the perpetual and ominous shadow of the dreadful phrase ‘the clash of civilisations’. "Everyone should read your books for they contain fabulous stories of apology and forgiveness that reveal a completely different expression of human nature that is perpetually overshadowed in our violence driven media cultures. But your accounts are all equally true and expressive of the resilience of the human spirit and the capacity of even the worst societies to change." Comment on his blog by Rabbi Marc Gopin, Director of the Center on World Religion, Diplomacy and Conflict Resolution at George Mason University. This book is a sanguine and much-needed way forward and it is a must not only for the students and scholars of politics and religious ethics but also for general readers. This is a timely and necessary book from the pens of distinguished public figures and writers. Showing clearly that there is no military solution to the many problems we face, it is a humane and thoughtful guidebook to the troubled times we live in. Never has a darkening world more needed tactics of reconciliation and of its handmaiden, forgiveness. This fine and welcome book does the ultimate: it tells is HOW it can be done and has been done in history. A big Thank You to Michael Henderson again! These beautifully written and sensitively told stories of forgiveness and peace should provide inspiration and hope for many readers. Need a strong dose of hope for the future of the human race? Read this book. In numerous true stories, it offers antidotes to despair over our human proclivity for killing and degrading one another. The name of this good medicine is forgiveness, and the health that it portends is reconciliation between peoples torn apart by great crimes. These stories are balm for hurt minds, especially the minds of us who struggle over the mystery of evil in human affairs. Better, after reading this book, to stand in awe at the mystery of the good. Violence and other forms of sin shrink our lives and our imaginations; forgiveness enables them to expand. In this engaging and stimulating book, Michael Henderson tells stories of extraordinary people from around the world whose commitment to forgiveness stirs our imaginations and offers hope for new life in the future - for all of us wise enough to heed their examples. A book that never evades the terrible reality of suffering and injustice, and yet whose answers burn with honesty. Here is the climb upward to healing, brave, difficult but possible. Read it and be filled with admiration and hope. I cannot stress enough the importance of this subject, because without forgiveness there is no future for mankind or for anyone of us. Forgiveness is a power available to anyone who truly desires it, both victim and perpetrator. It is the only hope also for nations that have lived in perpetual violence towards each other. Forgiveness is a power that we can decide for, and it can be bestowed on anyone. Michael Henderson has written an extraordinary, inspirational book based on more than 25 narratives of people, groups, and nations who have taken the initiative to reconcile – to heal - destructive conflicts that seemed to have no end. The efforts of these healers are clearly acts of courage given the risks to their reputations and even to their lives. Scholars and lay readers will use these narratives to identify and study the various aspects of the interactions of each party that lead to the relinquishing of revenge and experiencing each other in a new light. They will observe how emotional healing results from many factors including the restoration of dignity, the mutual respect of life stories, apologies and forgiveness. Many of the narratives are so moving that they brought tears to my eyes. The number of nations and groups (representing all continents) involved in these destructive conflicts illustrates the prevalence of harmful, vengeful behaviors on our earth. The courage and commitment of an increasing number of people and groups who are willing to risk so much to resolve these conflicts and preserve our existence is testimony to the success of Michael Henderson and his colleagues who study and write about those who exercise the power to heal. This book is a major contribution toward understanding and implementing these healing processes. This work is an essential counterforce to the destructive tendencies of people and societies. These are extraordinary stories that you will never forget. In No Enemy to Conquer Michael Henderson takes us across the globe and shares with us the remarkable journeys that have led individuals and families to a place of hope and healing. His writing is honest, unambiguous and without sentimentality. The authors invited to share their reflections on the stories in this book give us an absolutely brilliant analysis of the profoundly human moments retold by Henderson. With compassion and clarity, Henderson invites us to witness the compelling power of forgiveness and to listen to the voices of people who dared to follow the wisdom of the heart. He leaves us with this message: forgiveness and reconciliation are vital for the repair of brokenness in the aftermath of trauma. The book is a careful and serious attempt to shift the emphasis from revenge to forgiveness and reconciliation. Readers will take away a deep appreciation of this fact: justice begins when the freedom to avenge a wrong is questioned. And here, Henderson shows us, where vengeance is arrested, forgiveness will blossom.